Lubert Stryer (born March 2, 1938, in Tianjin, China) is the Mrs. George A. Winzer Professor of Cell Biology, Emeritus, at the Stanford University School of Medicine. His research over more than four decades has been centered on the interplay of light and life. 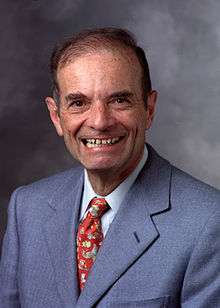 In 2007 he received the National Medal of Science from President Bush at a ceremony at the White House for elucidating the biochemical basis of signal amplification in vision, pioneering the development of high density micro-arrays for genetic analysis, and authoring the standard undergraduate biochemistry textbook, Biochemistry. It is now in its eighth edition and also edited by Jeremy Berg, John L. Tymoczko and Gregory J. Gatto, Jr.
Cheng-Wen Wu (postdoc), former founding president of the Taiwan National Health Research Institutes, 1996-2005, now Professor at the Taiwan Medical College. ↑ "President to Award 2005-2006 National Medals of Science and National Medals of Technology Honoring Nation's Leading Researchers, Inventors and Innovators - NSF - National Science Foundation". ↑ Stryer; et al. (2015). Biochemistry (8 ed.). Palgrave Macmillan. ISBN 1464126100. Retrieved 16 October 2015. ↑ "Alumni - MRC Laboratory of Molecular Biology". MRC Laboratory of Molecular Biology. ↑ McCarthy, Pumtiwitt. "Everything is illuminated: 'Reflections' on light and life by Lubert Stryer". American Society for Biochemistry and Molecular Biology. Retrieved 19 June 2016. ↑ Burgoyne, R.D. and Weiss, J.L., 2001. The neuronal calcium sensor family of Ca2+-binding proteins. Biochem. J. 353:1-12. ↑ "2007 Newcomb Cleveland Prize Recipients". AAAS - The World's Largest General Scientific Society. ↑ Latchman,D.S. (1995) Trends Biochem. Sci. 20:488. ↑ "BIO2010: Transforming Undergraduate Education for Future Research Biologists - The National Academies Press". ↑ "Points of View: Is Bio2010 the Right Blueprint for the Biology of the Future?". PubMed Central (PMC). ↑ "Recipients - ACS Division of Biological Chemistry Website". ↑ "American Academy of Arts & Sciences". ↑ "National Academy of Sciences". ↑ European Patent Office. "EPO - Stephen P.A. Fodor, Michael C. Pirrung, J. Leighton Read and Lubert Stryer (Affymax Research Institute, Palo Alto, USA)".